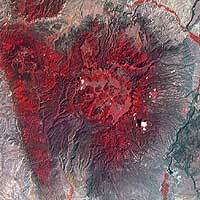 The volcanic foundation beneath Bandelier and the surrounding area is seen clearly from space. The Frijoles (free-HOH-lace) canyon and mesas are part of the Pajarito (pa-ha-REE-toe, Little Bird) Plateau which was formed over a million years ago from two powerful volcanic eruptions each of which were 600 times larger than Mount St. Helens. The Jemez Volcano ejected enough volcanic material to cover the area in a blanket of ash and lava up to 1000 feet thick. Over time, erosion formed the canyons and takes us to the present setting for Frijoles canyon with its Pueblo Indians. The pink rock that forms the canyon walls is volcano ash that was compacted over time to a crumbly rock called "tuff". Weathering gave the cliff wall a "Swiss cheese" appearance. 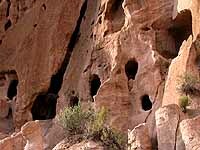 The Puebloan people were able to enlarge these natural caves for use as homes and for storage. 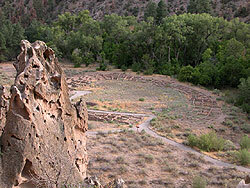 The central village in Frijoles Canyon, called Tyuonyi, is one of the largest and best preserved settlements in the region. Here was a circular community house that stood two or three stories tall, contained over 400 rooms, and housed about 100 people. Within the central plaza one could imagine children doing their chores, herding turkeys, and playing. Here the women might be tending their young, grinding corn, or firing pottery while the men were making stone tools, bows, and arrows. There was one entrance to the community which, during excavation, was found to have post holes in a zigzag fashion suggesting a barrier to keep strangers out. There are no indications of warfare, but the arrangement of the structure with its defensive location suggest that possible attacks were of concern to the people. Because the first floor rooms had no doors, a resident of this village would climb a ladder to the roof and descend into their home down another ladder through a hatch like door. His only possessions in this small dimly-lit room would be various tools, pottery, woven garments, turkey feather blankets and other practical items. An adjacent dark room would be used for food storage. Today, the walls of Tyuonyi are at the same height as when the village was excavated and have not been rebuilt. The National Park Service has stabilized the fragile wall by using mortar where needed to prevent further deterioration. Cave Rooms. Cave Room Interior. Numerous cave rooms line the canyon walls. These rooms were seldom used alone, but were the back rooms of a house structure similar to the reconstructed Talus House. Even though the rock walls are soft, it still would have been difficult to carve out the caves with their simple stone tools. The walls were plastered with clay perhaps for aesthetic reasons or to help prevent the walls from crumbling. Floors were sometimes plastered with a mixture of clay, animal blood, and soot. The ceilings are blackened with soot from fires used for heat, light and cooking. Most likely many of the rooms were decorated with paintings called pictographs, but most of them have disappeared as the rooms have crumbled. There are still remnants in some caves. The Long House is an 800 foot condominium-style community that extended along the canyon wall. The round holes were used to anchor vigas (VEE-gahs) or room beams for the homes along the wall. Many of these rooms have their original plaster due to the protection of the overhanging cliff. The number rows of viga holes shows how many stories the Long House had. 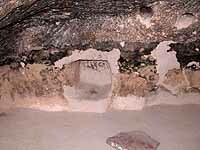 Kiva's (KEE-vah) are underground structures primarily used for religious activities. Since there was no written language, boys and young men were taught the oral traditions that were passed down from one generation to another. This included prayers, songs, legends, and stories. 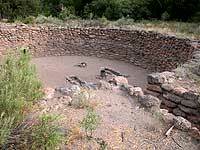 The Kiva was an important part of their culture. During the time when the Kiva was in use, it would have been covered by a roof made of wood and earth supported by six wooden pillars. A ladder coming out from the roof's center served as an entrance. There is a small hole called a sipapu (SEE-pah-poo) near the floor's center that symbolizes a place of emergence. Here the Puebloan ancestors could emerge from the world below into this world. This is a smaller Kiva. It is more traditional in size to Kivas though out the southwest. Two other unexcavated Kivas are in close proximity to it. In 1986 a colony of about 10,000 bats moved into this cave. They have returned every year up until 2002, but not in 2003. The fact that the bats did not return in 2003 has been disturbing and the reason is unknown. Sometimes people fear bats unnecessarily. They do not attack people nor get in their hair. Bats are wonderful creatures eating up to half their body weight each night in bugs such as mosquitoes, centipedes, and grasshoppers. Bats are a great help in controlling the bug population.